Iulius Markovits completed his studies in Chemistry with specific focus on hetero- and homogeneous catalysis at Technische Universität München in 2010. Afterwards, he worked as Research Associate for 4 years at the Chair for Inorganic Chemistry at Technische Universität München, where he received his Doctoral degree in Chemistry in 2014 under the supervision of Prof. Wolfgang A. Herrmann and Prof. Fritz E. Kühn. The topic of his PhD thesis was “Oxidation catalysis in ionic liquids”, which focused on catalyst design and characterization. 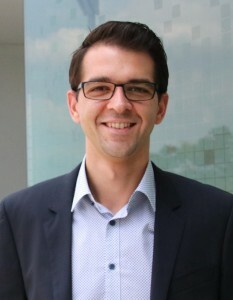 Since 2014, Dr. Markovits worked in Singapore as a Research Fellow at Nanyang Technological University followed by an additional year at TUMCREATE Ltd, where he pursued research for the use of ionic liquids as unconventional electrolytes in rechargeable Lithium and Sodium ion batteries. In 2017, he joined TUM Asia as Head of Faculty (Chemistry) and oversees the academic operations of two Chemistry degree programmes at TUM Asia.